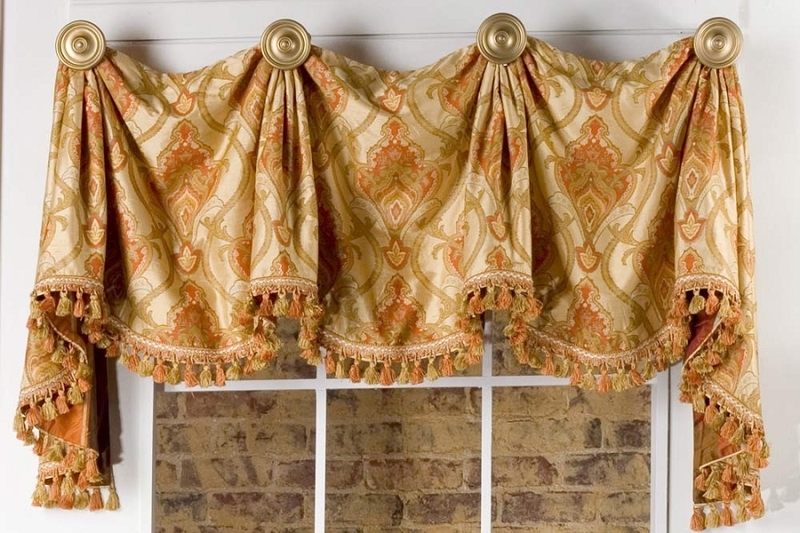 This unique valance with decorative ties is a casual take on a formal style and can be adapted to fit any size window by adding additional swag sections. 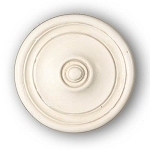 We mounted our valance on a rod with rings; however, decorative knobs/finials with posts could be used. Q: I have two questions: 1. 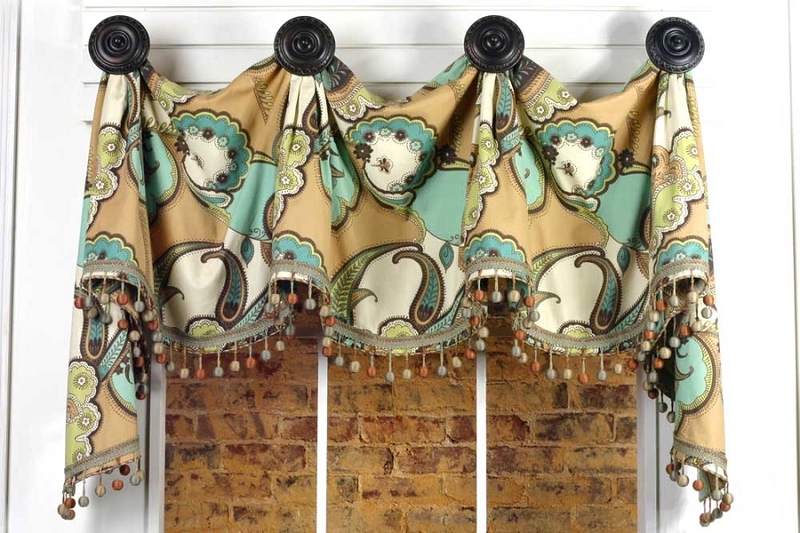 Can you make this valance without the ties? 2. If I use a tassel trim along the bottom edge, do I still need piping? If so, where is the piping used? A: The ties are certainly optional but you will have to be a little more particular when adjusting the gathers behind the ties when using a rod with rings. They can look messy but are easily adjusted. Just takes a little time. Of course if you use posts and knobs the gathers will be concealed and you don't have to worry about that. Q: is this using one uncut width of fabric or is it pieced together for the swags? Q: will this treatment adapt to a window size of 28.5> this includes window frame? Can I use a vertical stripe fabric. Q: I wrote this a few minutes ago, but I don't think it sent, so here it is again. What do you think about using this pattern for 3 windows of a bay window? The 4th is actually a door, so valances don't work well there. I'd love the pattern to continue across all 3 windows to create a flow. Q: I have a question regarding the lining and contrast fabric. Can I use the lining fabric for the contrast fabric as well? Thank you. A: It's totally do-able. 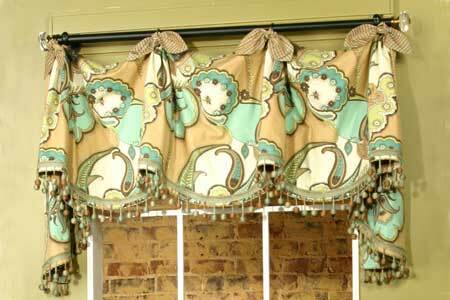 If you are allowing the valance to dip between the knobs you will need to attach a contrast skirt to hang behind the valance. 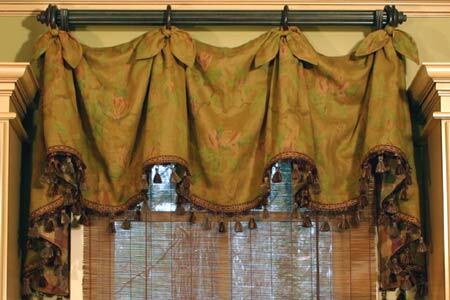 If not, the top of the valance can be stapled to the board. I usually serge the seam across the top instead of sewing and turning it so it will allow you something to pull up over the board to staple to. Give me a call at the office and I can go into further detail. Q: Can you eliminate the ties and just add rod rings? I am looking for a flat swag with horns--maybe tabs or rings to hang from a rod. Should I be considering other patterns to get this effect?